Over Drinks is your opportunity to be part of this years public art event. 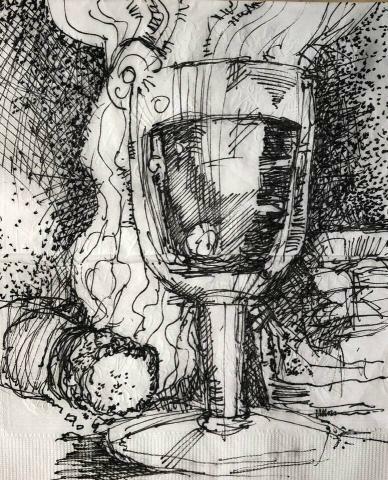 Get out your pens and markers then draw that idea down on a napkin, coaster, tablecloth, menu or placemat from either a bar, restaurant, pub, coffee shop or favorite watering hole of your choice. The history of art and architecture whose idea was sparked on a cocktail napkin is long and notorious. We started off New Year's Eve evening with a flurry of drawing. Now it is your turn to get involved. Site specific drawing events will be happening at our favorite spots locally all year long. Stay tuned for dates and locations. Not in the area? The mail works just fine so send your creations in. Get started now. We all know"Over Drinks" is where the best ideas occur!